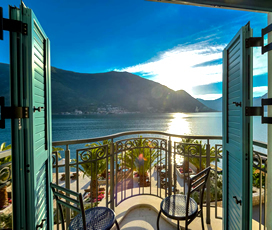 "Kotor is situated in a beautiful, secluded bay with awesome mountainous views. It is also a hot-spot for Yachts and carnival events during the summer months..."
Kotor is a truly stunning ancient town & a UNESCO World Heritage Site. Kotor is situated on one of the world’s most beautiful secluded bays (Boka Bay) coming off the Adriatic coast & is surrounded by lush rolling mountains, offering quite spectacular views.Nestled between two imposing mountains and situated in the beautiful Bay of Kotor, the city of the same name is an incredible holiday destination, combining stunning nature and architecture to form the complete holiday package. The Old Town is very well preserved & was built up between the 12th & 14th centuries. As the secret of Kotor’s beauty gets out, it is slowly becoming a more popular destination & in the summer months the yachts of the super-rich fill the marina. The town also plays host to a number of events & carnivals over the summer. Its medieval, walled old town is a hidden jewel that compares favourably to more well-known cities like Dubrovnik and offers medieval winding streets that everyone is bound to enjoy. 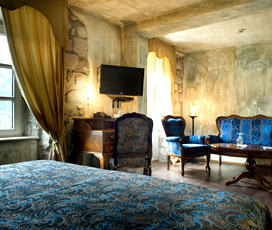 Coupled with this is a vibrant nightlife, great food and a plethora of great sights nearby, such as the historic town or Perast, ensuring that there is something for everyone in Kotor, whether it is a family holiday or romantic break. The walled town is situated next to the beautiful turquoise waters of the Adriatic, in a sheltered bay, which is framed by dramatic limestone cliffs and the mighty Mt. Lovcen. The town itself is famed for its rustic medieval streets, gorgeous Romanesque churches and the spectacular Kotor Cathedral. The town is fairly small with a population of around 14,000, making it ideal for a peaceful holiday amidst beautiful nature and a rich history. 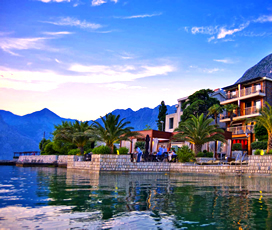 Kotor has a temperate seasonal climate, which experiences hot summers and cool winters. The best time to visit is in June, July and August when the temperatures average above 25 degrees. Late spring and early autumn are also pleasant although the chance of rain does increase slightly. The best swimming month is August when the sea temperature is above 26 degrees. Under the Romans, Kotor came to prominence and they ruled the town from 168 BC until the empire’s collapse in 476 AD. It then passed to the Byzantines and remain largely unchanged until 1185, when it became a part of the medieval Serbian state. It briefly became an independent state from 1391-1420 until it elected to come under Venetian rule, due to fears that the Ottomans would attack it. This state of affairs persisted until 1797, when the town passed to the Austro-Hungarians and eventually joined the Yugoslav Republic after the Second World War. The town also experienced many natural disasters during its history, with numerous earthquakes hitting between 1500 and 1800. Perfect for active families who like to get out and about and explore nature, the city is surrounded by hills and mountains, offering plenty of great hiking and biking trails for those who want to explore the Montenegrin countryside amidst spectacular scenery. Combined with this are several excellent beaches that provide access to the sheltered bay of Kotor, along with the option to enjoy watersports like kayaking, ideal for family holidays. Families should be sure to climb the old town’s medieval walls, which provide a panoramic view of the surrounding area. The Cathedral of St. Tryphon famed for its Corinthian Columns and Romanesque architecture is an impressive building that visitors are bound to enjoy. While the chance to wonder around the beautiful old town with its 15-metre-high medieval walls should not be missed. The area is also excellent for kayaking, thanks to the sheltered nature of the Bay of Kotor, ideal for those who like to get out and about. Finally, the beautiful old town of Perast, which is situated on the coast and offers spectacular views over the sea and surrounding area is a must-see during your time in Kotor. Its night-time scene is largely centred around the old town area. There visitors will find a variety of cafes, bars and clubs, playing music late into the night. This makes it perfect for those who want to wander up and down the cobbled streets swapping from bar to bar. There are also plenty of nice restaurants closer to the seaside, for those seeking something quieter. 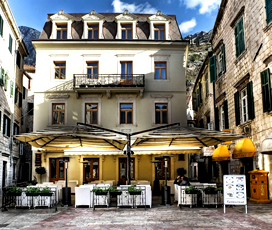 The best shopping to be had is found in Old Kotor, where there are a large number of shops and boutiques, which generally sell fashion pieces from big name Italian designers. Other things on offer include jewellery stores, antique shops and all the other things that you would expect to find in a modern tourist town. There is also a market that is held daily close to the second entrance to the old town, selling both local produce and handmade local products.